We are a UK-based re-enactment group set up to portray the 4th (King's Own) Regiment of Foot - an infantry unit of the British Army circa 1815. 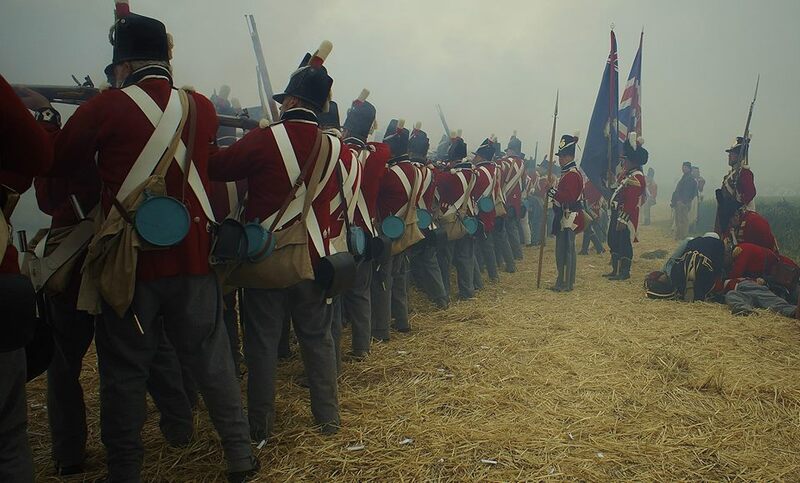 Founded in 2012 as a project for members of the 'Sealed Knot' to participate in the bicentenary of the Battle of Waterloo in June 2015, the unit took to the field (along with it's fellow 4th groups from the United States) and mustered 50 Privates, two Sergeants, one Quartermaster Sergeant and an Officer, thereby earning the distinction of being the largest single Redcoat unit at the event. The 4th Foot has decided to continue post-Waterloo and is now an independent unit, affiliated to the Napoleonic Association of Great Britain. In addition to re-enactment events the regiment is available for displays, battles and evening merriment & singing. Two regiments of foot were raised for the defence of Tangier on 13th July 1680. The first regiment later became the 2nd Queen's Royal Regiment of Foot and the second regiment later became the 4th King's Own. The fortified Moroccan town of Tangiers was a wedding gift to Britain on the betrothal of Charles II to Katherine of Braganza in 1662. It proved more trouble than it was worth and was given up in 1684.